Spatchcock the quails by cutting them through the underside, then flattening them out lengthways. Set aside. Make the marinade. Use a mortar and pestle to crush the lemon grass, shallots, garlic, coriander roots and salt to a thoroughly mixed rough paste. Put this mixture in a bowl with the quail and use it to coat the meat. Leave the quail in the refrigerator to marinate for at least 1 hour. Put the marinated quail into a roasting pan and place it in the oven for 45 minutes. While the quail is cooking, make the dip. Combine the fish sauce, lime juice, chilli powder and chopped spring onion in a bowl. Decant the mixture into a sauce dish and top with the roasted rice. Once the quail is cooked, leave it to stand for a couple of minutes, then cut into medium-sized pieces if you wish. 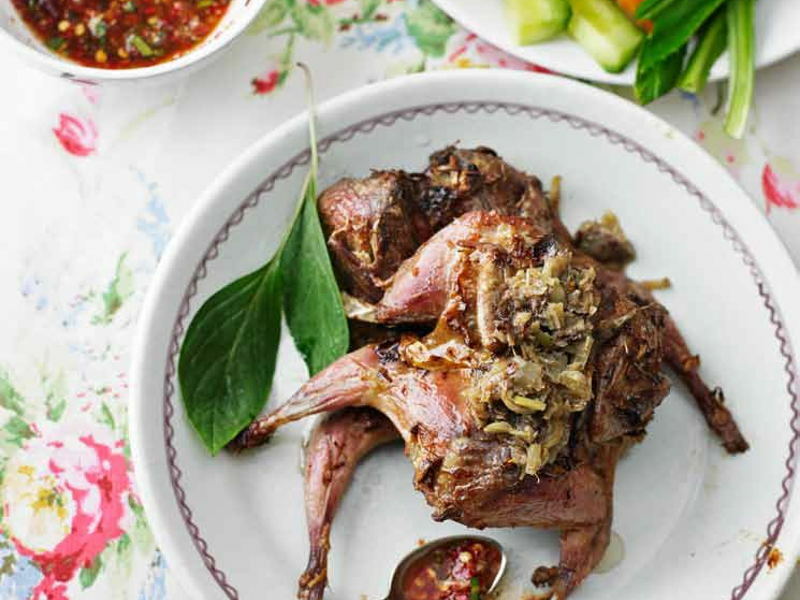 Serve the quail with the dipping sauce and fresh salad.